A simple standard setup using a super serial card will transfer disks in under a minute. I'm still using the older 1.1.X version, and yesterday I found that it takes 12-20 minutes to transfer and write 140K. Is that unexpectedly slow? I suppose I should try the 2.0 version if it has speed-ups, in particular if I can get down to 3-4 minutes per disk, it would be an extreme improvement while still looking for a Super Serial Card that is priced right. Edited by Osgeld, Sun Jan 25, 2015 12:08 AM. In case I was unclear, the times I quoted refer to the audio interface. As for SSC, that is $40 plus $20 overseas shipping which is one of the reasons I've hesitated so far. If you're using audio, you definitely want to go to 2.0.0 and dial the blocks-at-once way up. It's not going to be serial-fast, but it'll be faster than before. I had a brief try last night. While the old 1.1.9 version works well, bootstrapping the new client didn't work on first try. It says I should keep the volume at 1/2, which is much lower than I usually have the PC settings when using ADTPro. Probably I'll try again tonight, as I presume I need the 2.0.0 client on the Apple clone in order to take advantage of the speedups, i.e. it is not sufficient to use the latest version on the PC side with an older version on the Apple side? FWIW, I am planning to restore some Basis utility disks, whether they'll be bootable on my computer lacking the Basis set of ROMs, and hopefully figure something out with the RS-232 port. Although a bit off-topic, if I want some generic terminal program on the Apple just to see if I can establish any form of contact with a PC, what should I look for? I found some hexadecimal addresses before, but I'm not sure what I can do with those on my own. Also I suppose one possiblity for malfunctioning RS-232 could be if the 6551 in my machine once has blown, so probably I should check my supply for spare chips. I had a brief try last night. While the old 1.1.9 version works well, bootstrapping the new client didn't work on first try. It says I should keep the volume at 1/2, which is much lower than I usually have the PC settings when using ADTPro. You want to use the same volume setting that works for 1.1.9. I inserted the card into the slot marked as 3 on my Basis 108, and booted ADTPro 1.1.9 as I never managed to get 2.0.x to work properly before. Before doing that, I set the jumpers as indicated on the ADTPro website, so that part is not overlooked. The block points downwards to Terminal too. ADTPro detects the card as SSC in slot 4, and off we go... I wished. I am able to issue the command to request directory, and the ADTPro client on the PC detects the command, but the Apple clone never receives any files. I tried both with default settings of 115200 baud and dumbing it down to 9600 baud. When I manually set ADTPro to assume there is a SSC in slot 3 instead, absolutely nothing happens. I tried to rotate the block to Modem, but then nothing happens no matter if I configure it in slot 3 or 4, so that setting was mostly correct from the start. I even tried slot 2 as well, but it cause the computer to reboot. Stupidly I saved the config file. From BASIC, I issued IN#4 followed by Ctrl-A which displays the APPLE SSC prompt so that seems to be correct. I entered 14B and tried to bootstrap the client, but not a single character appears on the screen. Again I don't know which speed 14B is supposed to be but I tried with the PC set both as 115200 and 9600 baud. Finally I tried to DELETE ADTPRO.CONF to set it to defaults as the website says, but it just ended with a prompt *** UNABLE TO LOAD PRODOS *** so that means I'm pretty much stuck for the moment. Sigh. I thought this was supposed to be easy. Perhaps the problem is that I'm using an Apple clone that has its own, unaccessible serial port, or that my cable has too many unknown parameters and I'd be better off soldering my own DB25M - DB9F cable that I know for sure is correctly wired. Edited by carlsson, Thu Oct 12, 2017 4:20 PM. It's a long shot, though it worked for me, to set serial config to "//c with Imagewriter cable" even if you have neither. I believe you need a null modem adapter in the chain somewhere and you currently don't. This basically cross-wires transmit to receive and vice versa. I believe you need a null modem adapter in the chain somewhere and you currently don't. But the problem is, he doesn't know what the pedigree of the pinouts are. Most importantly, how the handshaking wiring is configured - which is why the "//c with Imagewriter cable" suggestion is a good one. It will make different assumptions about how handshaking makes its way through the cabling. There's also an outside chance the USB-serial adapter is marginal, makes marginal connections, or has a bad driver. But we don't know any details about that either. Edited by david__schmidt, Fri Oct 13, 2017 10:52 AM. There is no USB to serial adapter in this equation. My 2006 vintage PC has a real serial port, and it works 100% with e.g. N8VEM SBC for uploading files to that board. But I'll try to wire my own DE9F-DB25F adapter to eliminate at least one of the unknown cables, and keep the gender changer. Actually I'm wondering if I can remove the 2x5 pin IDC cable that ends with a DB25F from the SSC, and instead put a 2x5 pin IDC cable from a newer PC that has a DE9M instead, if the two tend to have the same pinout to the board. But I'll try to wire my own DE9F-DB25F adapter to eliminate at least one of the unknown cables, and keep the gender changer. I'm worried about the gender changer too - unless you can verify it extends the pins one-for-one, I'd want it gone too. The pinouts are definitely not the same. I am bit frustrated with my new ADT Pro 2.0.2. It seems not work. I believe I downloaded a newest version of Java Script. Builtin version : Version 8 Update 151. When I click on "Serial" button and it appear "There are no serial ports or the serial library RXTX is not installed or visible. " BUT there are completed installed everything included RXTX programs. I am using on Window 7 Professional. I tried to use It with my Apple III this afternoon. I dies without giving an error when I try to connect, and the log files are no help. It briefly says connected before exiting. I'm not sure if it's the cable or my new USB to serial adapter. I think it's an uncaught exception. Edited by JamesD, Sun Oct 29, 2017 9:11 PM. Older versions of ADTPro client for SOS did not catch an exception thrown when some connection states changed. That was fixed in 2.0.0. Does this mean that 2.0.1 still works for you, but 2.0.2 fails? I'm concerned if you changed the level of your Java at the same time. Oracle does a bad job of deciding if you're 32-bit or 64-bit (or has in the past, anyway). So the thing to look for is the bit-width of your Java installation vs. the bit-width of your Windows 7 Pro installation (which could either be 32 or 64 bit). Edited by david__schmidt, Mon Oct 30, 2017 8:09 AM. Yeah, I ran into the Oracle 32 vs 64 bit issue myself. I was using a laptop I purchased as a backup for my other one and I hadn't installed Java on it yet. I wouldn't have known what the problem was if I hadn't checked the log files. I'm using the latest version of ADTPro, so I'll just have to double check everything. FWIW, yesterday I soldered my own DE9F to DB25M RS-232 converter according to schematics found on multiple sites, all 9 wires so I'm just using the known working DE9F to DE9M cable, my newly made converter and directly to the DB25F on the SSC. Sorry to say the SSC still doesn't listen. 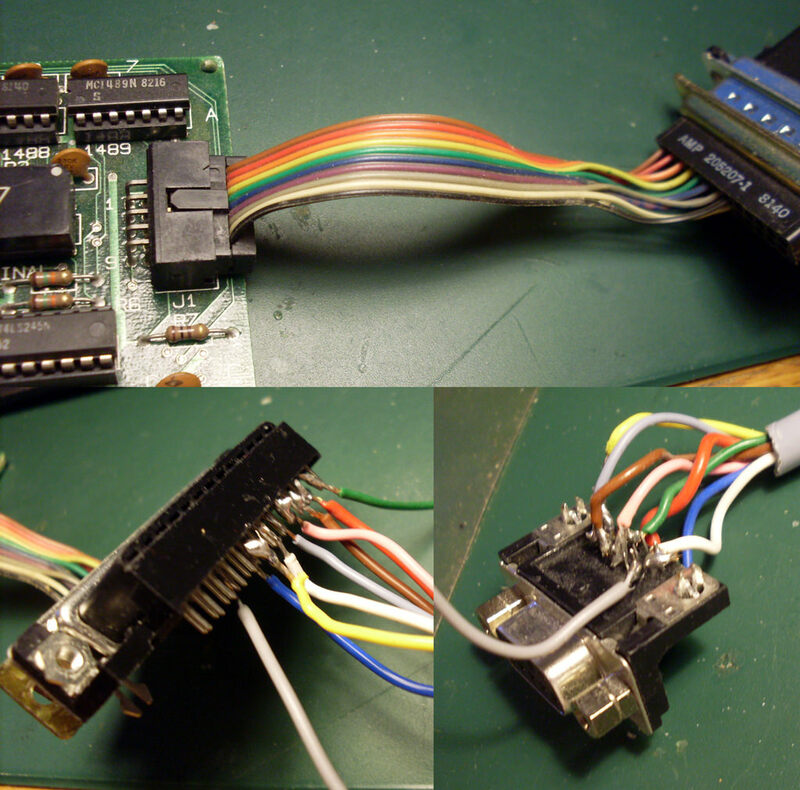 I noticed its cable uses more and other pins on the DB25 than what those schematics online suggest should be used in a RS-232 application, so perhaps I need a custom 25-pin SSC to 9-pin serial converter, or the card is partly toast. I've got a second SSC at the club that I can try eventually. To make matters worse, I was unable to get the audio connection working properly too, probably a matter of volume on the PC sound card so I'll keep struggling with that a bit more as it used to work with 1.1.9 for me. perhaps I need a custom 25-pin SSC to 9-pin serial converter, or the card is partly toast. 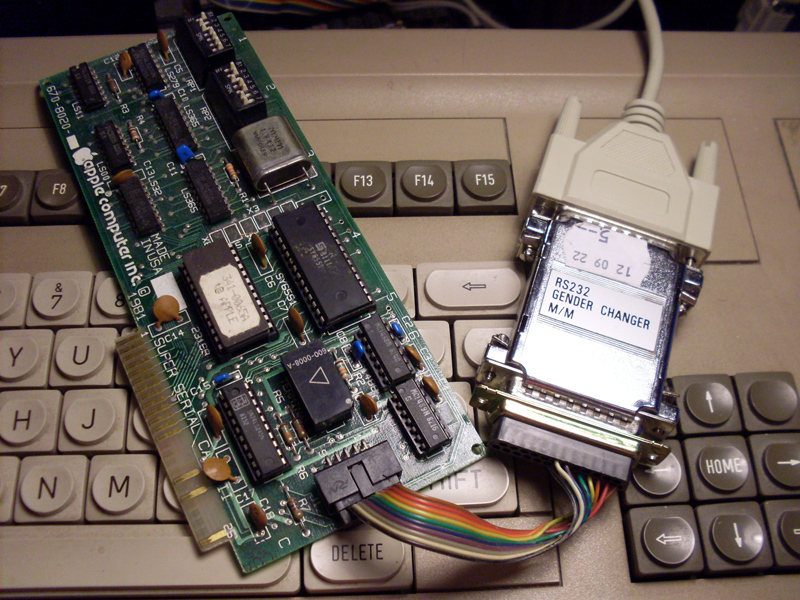 Is the pigtail you have today (the IDC-10 header to DB-25F) a standard issue for the SSC, or is it a PC-based one? Because they're different, and the PC-based one won't work. Apple doesn't need any more "all-praise Apple guy"s. My advice to you is just do what interests you. Sometimes hardware goes bad. Sometimes folks have bad luck. Spares help, but if you're not replacing the thing that is actually hindering progress, you're not going to progress. Right now, none of us knows exactly what that is in your situation. Yeah, I ran into the Oracle 32 vs 64 bit issue myself. I'm now printing out the equivalent of the commands I mentioned above to the console when ADTPro starts so in the future I can just ask folks to paste in what the console says on startup. If I gain some confidence in the ability to test bitness on all platforms, I'll be able to put up a dialog box or even quit, complaining that the environment is incorrect. I looked at the batch file that starts it on the PC but I haven't tried typing the launch command directly. Edited by JamesD, Tue Oct 31, 2017 9:39 AM. I hadn't even thought of that - I was having trouble finding a cross-platform way of checking bit width of the OS from within Java. Moving that out into the Winders batch file solves that problem right there! It is quite obvious that my adapter cable lacks connection to pin 1 (Protective Ground) and pin 19 (Request To Send #2) which are implemented by the SSC pigtail, in case that would be a cause for not working? At least I got "send" to work with the original cable mess, as my PC detected the request, just that the Apple never received any data. Here is a picture of it all. I can assure you that although my soldering is not pretty, I have not short circuited any pins. Edited by carlsson, Tue Oct 31, 2017 11:24 AM. What's your conversion pinout from 25-pin to 9-pin?